Take your time while assembling and the results will be pleasing. Saved $$ vs. using a local frame shop. I have been purchasing this frame for years...I use them for small original works of ark that I get when traveling. Over the years they have been consistently perfect. Thanks. My wife and daughter and I have been ordering these frames for years and have always been very satisfied with them. This time I got the acrylic covering and foam backing and all arrived well packed and in good shape. The picture frame was perfect, just a little disappointed in the clips. Was looking forward to the corner clips, but got side ones instead. Hello Norma! Thank you for your recent purchase! We are so pleased to know the frame is perfection in your eyes! We regret that you did not approve of the hardware that we sent with the frame. The hardware we send is recommended by the manufacturer of the Back Loader Frame. You should have corner brackets to join the corners, spring clips to secure the backing and hanging wire to hang the frame with. If you have a need for extra hardware of want to see if we have a special type you prefer, please reach out us. We can be reached directly at 1-800-332-8884. Happy Framing. Have an awesome day! I bought 2 of these frames for 2 18x24" photos. They look beautiful. The only downside was that there were not enough pressure clips provided for both frames to keep the pictures in. I had to go buy some, which was annoying. Otherwise, very pleased... so pleased I bought another one. Hello Shiva! Thank you for your recent purchase! We provide a standard amount of hardware and hanging wire to suit your needs. We apologize for any inconvenience. We are always willing to send you free additional hardware if needed. Please reach out to us by phone if you have a need in the future. We can be reached at 1-800-332-8884. Happy Framing! The frames arrived on time and are of good quality! Very easy to assemble, and all the hardware was included! Came in carefully packaged. Decent quality, easy set up. Great frame for something that you want to be stylish and still have most of the focus to be on the work of art. I emailed frame measurements, frame selection, and matting selection and received a perfect frame in less tha 10 days. I could not be more pleased. All of this at a very reasonable price. Easier than going to a custom frame store. From beginning to search for just the right frame on the web site, to the simple ordering process that give plenty of specific details so I'm assured of exactly what I'm getting, to quick and carefully packaged delivery, and finally to the ease of adding my photo's, I have used pictureframes.com for years and have never been disappointed. This latest pair of frames was again exactly what I wanted and the perfect decorating touch to finish a newly remodeled room. I am incredibly happy with the frame. It exceeded my expectations for quality. It's perfect that you can buy different lengths and widths. Perfect for a Mick Jagger photo!...simple, clean lines, frames photo beautifully. Also easy to order and install. This frame made a lovely surround for a small watercolor. Nicely put together. I was able to order a frame size within 1/8" so it fit my odd size art perfectly. The quality of the frame was great. It came fairly quickly so not much longer than a local frame shop would take to fill the order. I am happy I found PictureFrame.com. Looks great, easy to add the hardware. I received the frames & they were very well packed, but in the info you state that 16"x20" frames need spring clips for the side but you don"t supply them with the frames (2 frames=8 additional clips) also I only received 2 hanging clips for 3 frames I ordered. Please send the hanging clip & 8 spring clips so I can finish this project. Thank you, Paul. Quick and easy. A clip had broken off. But the frame still holds the photo and looks great. My picture is still Rolled up.. my new frame is still in pieces!! The acrylic came the incorrect size...so it would not fit on the frame!!! the other frame I ordered did not come with hardware! I was waiting for the 3rd replacement frame.. all I got was 3 hardware kits!! The emails to fix the problem from you sizes were in CENTIMETERS!!!! All of your emails did noting. Hello Blair. Thank you for your feedback. We regret to hear you were not pleased with the order. We certainly put forth the best effort to resolve your issue. Since we could not confirm if the acrylic or the frame was the incorrect size, we placed the replacement order on hold. We measure our frames by the inches instead of centimeters. We also add 1/8" allowance to the width and height. We certainly want to make this right with you. We are awaiting a response from you via email to see if you have measured both the acrylic and backing to determine the issue. We are willing to replace the incorrect sized item at no charge after we confirm the exact issue. Please let us know how we can make this right with you. Happy Framing! Good looking frame - very dimensional, liked the color, will enhance the pictures. I'm very happy. Price was great too. Whenever I need a frame, I always purchase at this site. There are so many choices, and I've NEVER been disappointed with my purchases. I think it matches others that I already have. The silver frame was perfect for my photo photograph, the tone of the frame with the black mat I purchased would make the image pop! First and foremost the quality of all components of the frame is solid including the matting, acrylic face and backing. It looks very professional in an office environment to display all of our patents. Sleek, contemporary look, easy to assemble - blends well with other picture frames. These frames are very simple, but very classy. They let people focus on my watercolors themselves, and not the frames. closet match to frames I have that this will be in same grouping. Price, I looked at other web sites and stores. Simple and modern design for prints I found at an art fest. I've used them before with good results. To pick up shiny silver lettering on this poster...the poster is completely black otherwise. I like a skinny frame and I choose this collection because it comes pre-assembled. As an avid recycler, etc. I was impressed by your sustainability practices! It is the right color and size. Goes with the needlework colors. Living room colors are black and silver. it's similar to the frame i had on the photo i'm reframing (had to rush a different photo and used existing one) ...nice quality. I picked these to match other frames I already have, and that have worked well for me. I know they are good quality, and they come with hanging hardware. Looked very professional, yet stylish. Quality frames for bargain prices! I chose this simple frame and pink mat for a picture of an antique wedding dress . The dress is set on a black background and appears in shades of white and grey. The picture is very stark and beautiful all at the same time. I am hopeful that the mat will soften and and compliment the dress . I chose it because it will fit in nicely with my current artwork and the colors in my room. have a 12x12 asphalt tile someone painted on for me that I would like to frame in a thin silver frame. What do you suggest? BEST ANSWER: I would recommend a deep frame for a sturdy frame to hold the weight of the asphalt. Our Super Canvas Woods frames may be a good way to go. https://www.pictureframes.com/Custom-Frames/Canvas-Ready-Wood-Picture-Frames I would stay away from the metal frames unless your tile is thin and light weight. The polished silver frame gives a clean, elegant look to whatever is framed. I use them for my black and white photographs, and I refuse to use anything else. Are there spacers available to keep my artwork from touching the glass? BEST ANSWER: Hello Jonathon! We have spacers available in sizes 1/8", and 1/4" and in colors clear and black. Please give us a call to make this request over the phone. We can be reached at 1-800-332-8884. Thanks! Will this pre-assembled frame fit a 0.75 inch canvas? And does it come with clips to keep the canvas in place? BEST ANSWER: Hello Sandy! Thank you for reaching out to us. The depth of the frame is 5/8" which is 1/8" less than the depth of your canvas. The frame will work, however, there will be 1/8" of canvas protruding from the back of the frame. You may not be able to notice visually but the frame will not be completely flush with the wall. May we suggest going with a similar frame such as the HS15 Frame below? The depth of the frame is 3/4". If you have any additional questions, please let us know. Have a wonderful day. 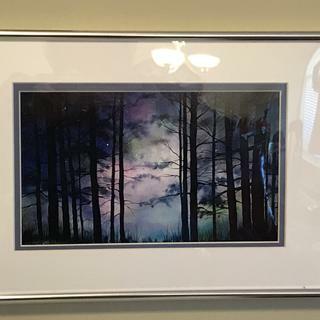 Need to know what size of this frame I should order to fit a piece of glass that is exactly 36"x24"? BEST ANSWER: You will need to order size 36"x 24". Our frames have a 1/8" allowance which means the frame opening will be 36.1" x 24.1". If you would like the frame to be the exact size, please give us a call to place the order over the phone. We can be reached at 1-800-332-8884. Can this frame be used on a table? BEST ANSWER: Hello Barb. Thank you for submitting your inquiry regarding our SLVBLS. This frame is designed to hang on the wall, and does not come with an easel back to display on a table top. However, our Archival Metal Table Top Frames are Metal, and designed to be displayed on a Table Top. Please see the 12AP frame below. Thank you for submitting your inquiry. Have a great day. I need a frame for a stretched canvas 20" h x 30" width in silver color metal. Which frames will accomodate the depth of the canvas?